Microsoft today released its developer preview version of Internet Explorer 11 (IE11) for those devices running its Windows 7 operating system. In doing so, the company seeks to show developers that apps produced for its latest browser will work across many different devices while also showing that its browser is very scalable. While Microsoft touts IE11 s ability to offer improved browser performance such as faster page load times and new standards support for websites, this release also include a completely revamped F12 developer tools. IE11 first hit the scene at a reveal during the company’s Build conference in San Francisco. Until today, it was only available with Windows 8.1 – and only to those users who feel the risk to upgrade is worth checking out the upgraded OS. The latest version of Microsoft’s browser is billed as a platform to help create “the best experience on the Web” and the company states that browsers are no longer a simple commodity – rather, they’re key platform differentiators. The IE11 developer preview for Windows 7 is the first time Microsoft is opening up the browser to a large audience, hopefully recognizing that there are many consumers that don’t have Windows 8 installed. Those that install IE11 will receive all of the performance, security, and “under-the-hood” changes highlighted at Build. We’ll save you the promotional information about how good Microsoft thinks IE11 is, but in short, the company touts that the browser is the first one to integrate the W3C Resource Priorities standard, which helps to determine what should be loaded first, thereby reducing load times. Additionally, it supports HTML5 link prefetching and pre-syncing, processes that provide a measure of predictability the browser can use to anticipate where the user wants to go next. User interface responsiveness and memory profiling: Developers can now look at a website and understand where pain points are in the UI, including if there’s a lag in responsiveness. It can detect where the issue is occurring and give the area to help developers make the necessary adjustments. Live DOM Explorer and CSS inspection tools: A feature that lets developers iteratively understand how IE is laying out and rendering web apps. Emulation tool: F12 now gives developers the ability to look at their site/app as it would appear on a variety of screen sizes, platforms, and devices – all without needing to leave the browser. 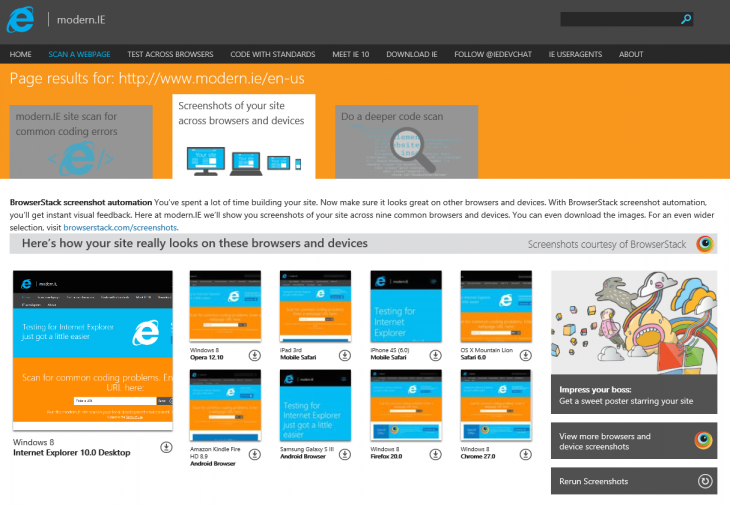 On top of the the availability of IE11 s developer preview, Microsoft is updating its Modern.IE website, the suite of free tools developers can use to help them spend “more time innovating and less time testing.” These tools are a tad bit different than what developers would receive with F12. Prior to today, Modern.IE offered three tools to help developers, including a ‘wizard’ to scan sites for problematic coding practices, three months of free virtual testing through BrowserStack, and an editorialized selection of best practices. Today, the site is receiving several enhancements, including a 25 percent discount on the purchase of Parallels Desktop 8 virtualization for Mac software. 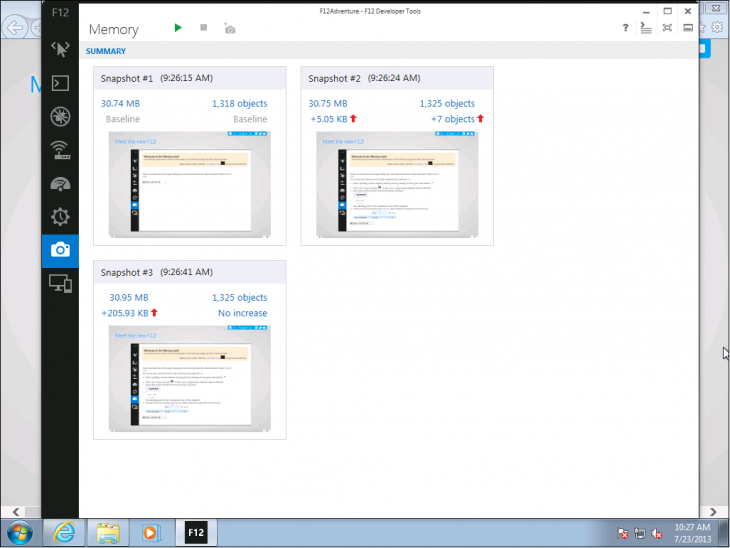 The site’s virtual machine offering now includes IE11 testing on Windows 8.1 and Windows 7 and the screenshot tool has moved to be open source – its code can be downloaded off of GitHub today.